We purchased this cross for our daughter's Baptism. The Baptism was only a little over a week away and so I mentioned in the notes section that if there was any way to get it in time we would greatly appreciate it. DeDee responded to my request within a couple of hours and worked directly with the artist to accommodate my request. She was responsive and so nice. I had the cross within a few days and we were able to have it blessed by our Priest the day of the Baptism. 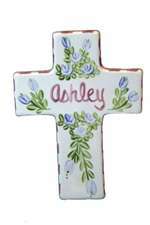 I highly recommend Tiny Keepsakes AND this beautiful personalized cross.